Can’t find a trial that fits you? Consider joining a registry or matching service to help advance research on Alzheimer’s disease and dementia. All studies have rules (inclusion and exclusion criteria like age, other health conditions, medications, and location) that limit who can participate. Studies might not be available in the right place at the right time for you. However, you can make yourself available to many local and national studies by joining a registry or matching service. Registries help speed up trials by giving researchers a list of “willing and able” potential participants. People who sign up may be referred to specific studies but are not obligated to participate. Some studies may be simple, like a survey, and can be done anywhere. The following registries accept adult participants with a variety of backgrounds. Open to individuals age 18 and older who are interested in learning about and possibly participating in Alzheimer’s prevention clinical studies and trials. Online registry designed to accelerate enrollment into Alzheimer's clinical trials. Open to individuals 50 and older. Take online tests to assess memory and thinking skills, gain access to scores, and be notified of opportunities for in-person assessments and clinical trials. Open to individuals age 18 and older who want to promote healthy brain function by preventing brain diseases, disorders, and injuries. Take online tests, learn about opportunities to participate in a wide range of studies. A contact and research registry for people diagnosed with frontotemporal disorders (FTD); open to family members, caregivers, or friends of people diagnosed with FTD disorders. Open to adults age 55 to 75 who are interested in enrolling in Alzheimer’s genetics studies. 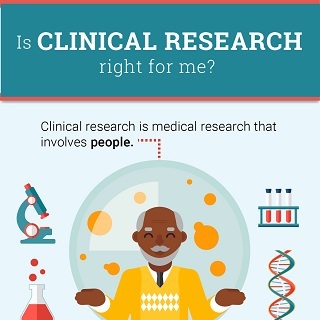 A service, funded by the National Institutes of Health, that helps match people of all ages interested in clinical trials with researchers. Requires an email address. The Alzheimer’s Association’s clinical studies matching service for individuals with Alzheimer’s, caregivers, and healthy volunteers. For further assistance with finding opportunities to participate in research, contact the NIA ADEAR Center at 1-800-438-4380.